The results of last weekend's games dampened the enthusiasm around some of the week 2 action, but there are still a number of excellent matchups to preview. The national spotlight shifts to Baton Rouge, Louisiana where two top ten teams will tangle on Saturday evening as Virginia Tech travels to Death Valley, where LSU awaits. The SEC also has a couple of key conference battles that will help shape the conference race as South Carolina visits Georgia and Alabama heads to upstart Vanderbilt. Heading up to the north, Michigan and Notre Dame are looking to rebound from a disastrous opening week, and they both must do so against tough opposition. Time for an in-depth review of week #2�s spotlight games. The top matchup of week #2 features two teams with dominant defenses but with questions still remaining to be answered on the offensive side of the ball. Last week LSU opened their season on Thursday night and proceeded to dismantle conference foe Mississippi State by a 45-0 score. The Tiger defense was the story of the night as they held the Bulldogs to only 146 yards in total offense and intercepted 6 passes, including 3 by safety Craig Steltz. Meanwhile in Blacksburg after an emotional pre-game ceremony, the Hokies defense suffocated East Carolina as Virginia Tech earned a 17-7 opening day win. The Tech defense played a huge role in the win as Victor Harris intercepted an ECU pass late in the 2nd quarter and returned it for a touchdown, giving the Hokies some breathing room after a tight 1st half. Let�s break down the head-to-head matchups in this Southern tussle. The Tiger defense is led by one of the best defensive lines in the nation, highlighted by tackle Glenn Dorsey, a dominant inside force who will be in the Tech backfield all night long. The LSU front 7 is stellar, and they are a major concern for the Hokie offensive coaches as they devise a game plan to slow down the Tiger speed. If Virginia Tech is going to have a shot in this game, Branden Ore will need to find running room and he did not have a great game in the opener, rushing for only 70 yards on 23 carries behind a line that struggled against the ECU front wall. The need for Ore is further stressed by the fact that Tech is 137-27-2 under Frank Beamer when they are able to out-rush the opposition and 19-55 when they are out-rushed. Also keep an eye on the Tiger secondary as they proved in week 1 that they are just as tough as the rest of the LSU defense and will provide Hokie QB Sean Glennon with a variety of looks that will keep him guessing all night long. With all the accolades the LSU defense is receiving, the Hokie defenders are also one of the best units in the country. Stay focused on the Tech linebacking corps led by potential All-Americans in Vince Hall and Xavier Adibi, who will be in charge of slowing the Tiger rushing attack. LSU did not have a great offensive start in their opener as they relied heavily on their defense to set them up in good field position. The ground game was average with Jacob Hester leading the way, but the offensive line did not create enough room, and with the unit returning 4 starters from last season, more is expected. Quarterback Matt Flynn was solid and will look to work with his new favorite target in Early Doucet, who had 9 catches and a touchdown in the opener. One of the evenings best matchups will be Tech corner back Brandon Flowers as he looks to contain Doucet and the LSU aerial attack. This game has all the makings of a classic defensive slugfest. Both teams enter this contest off an initial week in which their defense was in control while their offenses flashed signs of potential but were not consistent. Overall, LSU has the defensive edge and a line that can overwhelm the Hokie front that was not dominant against East Carolina, a troubling sign early in the season. The Hokies are likely to struggle in putting together any long drives and will have major trouble if Sean Glennon is forced to throw more than 25 times in this game. 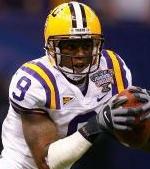 In the crazed atmosphere of Death Valley, LSU has the advantage and is ready to make a national statement. Georgia enters this key conference game off a tremendous performance in their opener, a 35-14 thrashing of a good Oklahoma State team. The story of the night was the Bulldog defense that returned only 3 starters from last season and proceeded to contain an explosive OSU offense for the entire night. Meanwhile, South Carolina was sluggish in their 28-14 win over Louisiana-Lafayette, but the Gamecocks were playing the game without starting quarterback Blake Mitchell, who was suspended for the opener but returns this weekend. The defenses have been the story in this series, with the last 3 games averaging 28.7 total points, and Georgia recording the 18-0 shutout last season. The Bulldogs have won 5 straight in this series and based on the results of the 1st week of action, the defenses look to have an edge yet again in 2007; especially keep an eye on Carolina�s Jasper Brinkley and Georgia�s Dannell Ellerbe. The winner of this one stakes a claim as a major contender in the SEC Eastern division title chase. This game became even more interesting after Texas struggled to put away Arkansas State on Saturday, winning a tight 21-13 battle after being out-gained by the Indians who put up 397 yards of offense. The Longhorn ground game could only muster 3.1 yards per carry in the opener and now runs into a Texas Christian defensive line that is among the best in the nation, led by the tandem of Tommy Blake and Chase Ortiz. TCU recorded a 27-0 win in their opener versus Baylor, but the Frogs still have concerns with an offense that is not yet clicking at full steam. TCU was unable to grind out long drives against Baylor, and quarterback Andy Dalton must play better for the Frogs to have a chance at pulling the upset in Austin. After going through the motions against ASU, Texas needs to unleash their offensive weapons and will need Colt McCoy and Limas Sweed to work downfield, as Jamaal Charles may find running room hard to come by in this one. The Sooners opened their season in absolutely dominant fashion in pounding North Texas 79-10. The question for Oklahoma entering the season was at quarterback, and Sam Bradford started the year in top form as he completed 21 out of 23 passes for 363 yards and 3 touchdowns. However, the real test will come this weekend when the Hurricane defense blows into Norman with defensive end Calais Campbell armed and ready to chase Bradford around the field. Miami took care of Marshall 31-3, but the Cane offense did not show enough firepower to scare the Sooner defense, especially quarterback Kirby Freeman who struggled while connecting on only 9 out of 21 passes. Freeman has to be a much greater threat on Saturday, otherwise the nasty Oklahoma defense will shutdown the Miami running game as the Sooner secondary will be able to contain the Cane passing attack with only its basic coverage package. This is a huge game for Miami to see if this program is ready to make a return to the national spotlight. To do so, the Hurricane defense must set-up their offense with good field position, just as they did in their game versus Marshall. Notre Dame had a brutal debut to their 2007 season, falling to Georgia Tech at home by a 33-3 score. The Irish were unable to get any type of offense going against the Rambling Wreck, as they netted -8 yards on the ground and gave up 9 sacks. Enter a Penn State defense, led by one of the nation�s best linebacking corps and a deep secondary, and true freshman Jimmy Clausen will have a major challenge on his hands in trying to improve the Irish offensive output in week #2. Penn State opened with a 59-0 thrashing of Florida International in a game that did not provide much information about the team�s overall prospects. There still remains a concern around the Lion running game which struggled early against an attacking FIU defense, and it will be interesting to see how the combination of Austin Scott and Rodney Kinlaw perform against an attacking Irish front as Notre Dame looks to force Morelli to the air. Penn State has waited patiently for this game after last year�s 41-17 loss in South Bend, and the Beaver Stadium crowd is waiting to greet Notre Dame to central Pennsylvania. This game has become the most intriguing matchup of the weekend after last week's stunning loss for Michigan to Appalachian State. The Michigan defense was unable to overcome the speed of ASU and will need a monumental improvement this Saturday as a much more lethal Oregon defense will pay a visit to the �Big House.� Oregon opened with a 48-27 win over Houston, a game that demonstrated an excellent Duck offense which was led by dual threat quarterback Dennis Dixon, who passed for 134 yards and ran for 141 yards. On the flip side, the Oregon defense gave up chunks of yardage to the Houston offense, yielding 315 yards on the ground. Expect Michigan to introduce Oregon to running back Mike Hart all day long with a plan of keeping the Duck offense tucked away on the sideline. This looks like a high scoring affair with offenses capable and talented enough to march up and down the field all afternoon long. Auburn struggled mightily in generating a consistent offense against Kansas State, finally earning a defensive score to put away the Wildcats. South Florida did not demonstrate much in their game versus Elon as their defense was in control from the start, setting up what looks to be a slugfest between two top-notch and aggressive defensive units. This is the best Vanderbilt team in years as the Commodores look to end a 19 game losing streak to the Crimson Tide. Vandy gave Bama all they could handle last season before falling just short by a 13-10 score. Tennessee needs this one to bounce back in a big way after their 45-31 loss to California before next week's game versus Florida. Southern Miss is always a dangerous team but will need major improvement in their passing game if they have plans on stunning the Volunteers in Knoxville. The Cougars' defense played lights out in their 20-7 pounding of a good Arizona team, only allowing a score in the last minute of the game. UCLA dominated Stanford 45-17 in their opener with Ben Olson tossing 5 touchdown passes; expect a much greater challenge this week for the Bruins from an excellent BYU team. Washington showcased its upgraded offensive talent in an overwhelming 42-12 win over Syracuse as the Huskies pounded away on the ground, churning out 302 yards. Boise State opened up by throttling Weber State, and the Broncos will need all their offensive weaponry against a vastly improved Husky team. California has one of the best collections of skill position talent in the nation, and the Ram defense could be in for a long afternoon. CSU will rely heavily on running back Kyle Bell to control the ball on the ground and to keep the Bear offense off the field as long as possible. Expect this one to be fought mainly on the ground as Rutgers will pound away with Ray Rice, while Navy will rely on the legs of QB Kaipo-Noa Kaheaku-Enhada who rumbled for 102 yards in the opener. The Knights dominated this game last year in recording a 34-0 shutout win, so the Middies are focused on developing a more balanced attack to keep the stifling RU defense from overwhelming their front line. Boston College earned a huge win on Saturday as they knocked off defending ACC champion Wake Forest, led by star quarterback Matt Ryan�s 5 touchdown passes. NC State comes off a tough loss to Central Florida, and the Pack needs this game or their season could quickly get away from them in early September. Nebraska started slow, then proceeded to steamroll a solid Nevada team by a score of 52-10 behind 233 yards rushing by Marlon Lucky. Wake lost in a shoot-out at BC and now faces an even better Nebraska team without the services of their starting QB as Riley Skinner was lost with a separated shoulder, which is not good after the running game was non-existent in week #1. Both of these teams enter this contest off of blow out losses; Toledo fell 52-24 to Purdue and Central Michigan was thumped 52-7 by Kansas. This has huge implications in the MAC West title chase as both of these teams are expected to challenge for the division title. The winner here takes a big step forward.